1 tsp Frescolio Black Truffle Infused EVOO Stir the truffle oil into the mascarpone. Bring the stock to a simmer in a heavy 6+ quart pot. Slowly whisk in the polenta. Cook on low stirring frequently for approximately 25-30 minutes. Remove from heat and stir in the cheese and olive oil. Adjust the seasoning with salt and pepper if desired. While the polenta is cooking, heat the extra virgin over medium-high in a large 12" saute pan. Add clean, dry mushrooms to the pan. Cook until the mushrooms caramelize and become crusty golden-brown. Add the shallot, and saute for two minutes, add the garlic and saute for a minute. Add the wine and cook scraping up the browned bits from the bottom of the pan and reduced by half. Add the stock and cook until reduced by half. Taste and adjust with salt and fresh pepper if desired. 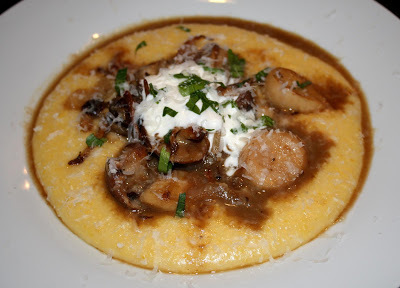 Serve the wild mushroom ragu over the hot polenta. Add a dollop of the truffled mascarpone, a sprinkle of romano cheese, and a pinch of minced parsley.